Epoxy resin is one of the most valuable tools available for modern boat repair and construction. Epoxy's popularity is due in large part to its versatility. It can be used for making small repairs as well as cold-molding a brand new hull. You can create a mixture with the precise characteristics that you need. The basic ingredient for all epoxy compounds, including glues and adhesives is the resin. By using a simple cookbook approach and measuring carefully, you can tailor both the handling characteristics and the physical properties of the cured resin. To achieve the proper ratios (resin/hardener) we offer calibrated pumps to deliver the correct proportions. Fillers are designed to thicken the epoxy mixture. Fiberglass cloth and other reinforcement materials are often used in conjunction with the epoxy to provide additional strength. 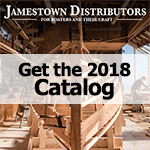 Jamestown Distributors is proud to offer a number of epoxy resin brands along with different types of fillers and compounds. We also have polyester resin, epoxy glues and adhesive, epoxy kits and fiberglassing accessories.